We present below description of global trends in FMCG industry. As an example we present also an analysis of FMCG industry in concrete country – in this example it is Poland. We encourage you also to get familiar with our offer prepared specially for clients from FMCG industry. Industry analysis of main trends in FMCG industry. Industry analysis of global trends in the FMCG industry in Poland. Emerging markets, like China, Brazil and India were less affected by the crisis and have the tendency to faster recovery. It happens mainly thanks to greater number of super and hypermarkets, which contribute to the development of FMCG market in mentioned countries. Common practice after the financial crisis was trade down trend and consumers return to cheaper and less famous products. Currently there is tendency to come back to more famous brands. Change of demographic trends which affect a lot of sectors of FMCG. Smaller rate of natural growth and ageing populations have big influence on consumer patterns and health and hygienic products spending. 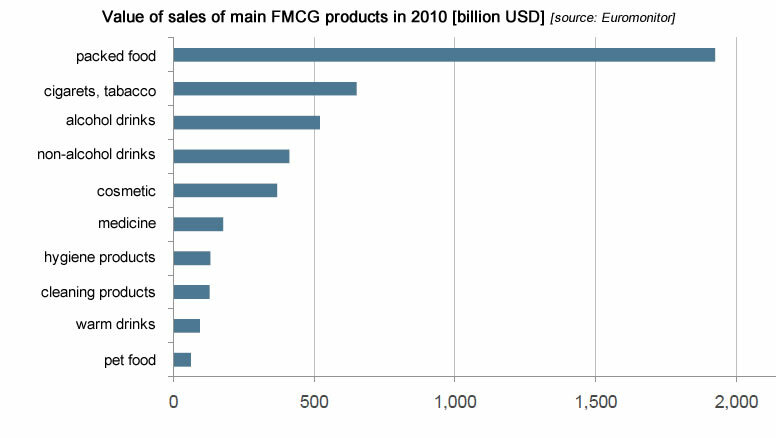 FMCG products, which after the crisis recorded the biggest sales growth (so called financial crisis winners) are mainly: headache and obesity drugs, contraceptives, coffee and tea ready to drink, food for children. These products occurred to be invulnerable to financial crisis. FMCG products, which after the crisis recorded the biggest sales fall (so called financial crisis losers) are mainly: wine, products full of coal, preparations for cleaning and polishing, coffee, alcohols, toilet hygiene products and well-known cosmetics. One of the biggest FMCG group of products are packed products, for example: food for children, pasta, chocolate bars, sweets and sauces, pastes, oils, and frozen products. Next places occupy cigarettes and alcohol – total value of sales of these products amounts to 1200 billion USD. Last places among significant FMCG products have warm drinks and pet food. FMCG industry (fast-moving consumer goods) includes, inter alia, groceries, also for animals, cigarettes, beer, cosmetics, cleaning and personal hygiene products, small household appliances. It will be presented exampled industry of FMCG – confectionery industry, which is one of the fastes growing FMCG industry in Poland. The production in confectionary industry has increased in the last few years, depending on product category, at a rate of a few to several percent per year. It seems that this segment is quite resistant to cyclical fluctuations – for example, despite the visible slowdown in 2008-2010, production of the confectionary industry had increased in that period. 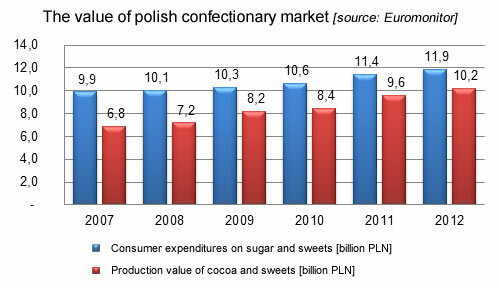 Market forecasts are very optimistic – currently the average consumption of sweets in Poland is few times greater than in Western Europe. Chocolate consumption is the example of the confectionary segment where Poland is far behind the Western Europe – in Poland the average consumption of chocolate per person fluctuates around 1,5 kg, whereas in Germany and Belgium it is 10 kg. Poles prefer milk chocolate (45% sales market share), on the second places locate stuffed chocolates. Only 7% of the sales generate white chocolate. 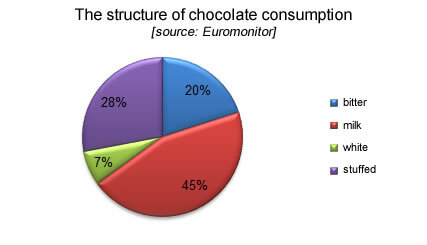 The only category, which consumption had increased in the period 2007-2012, is bitter chocolate (in 2007 the sales market share was 18%, in 2012 it was 20%).The increase of bitter chocolate is made at the expense of stuffed chocolate. Consumption of the rest of chocolate categories did not fluctuate significantly in the last six years. In the next few years the sales of confectionary market are expected to grow, both in terms of quantity and value. The value growth will be caused, among others by the continuing increase of material prices, used to produce sweets. The special recipients of dessert sauces from HORECA industry are points which specialize in ice cream purchase. 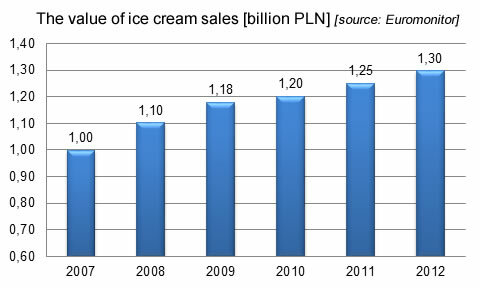 Ice cream segment is one of the fastest growing category on the food market, in 2012 ice cream sales reached the level of 1,3 billion PLN. It is estimated that the main impact on the confectionary market development will have the following market trends: – Further expansion of convenience products. Change of lifestyle, fastest pace of life encourage to buy products partly processed, whcich are easy to prepared at home. Market winners will be those who can save the clients time. – More and more common will fashion for healthy lifestyle and Helath & Wellness products – growing segment of people who care about healthy lifestyle and watch their weight. With increasing consumer awareness, producers will be forced to seek methods, that their products, which are traditionally not healthy and fattening, contain less sugar, no vegetable oil, preservatives, artificial fillers etc. It is estimated that in the coming years will gain on popularity, among others, products made from bitter chocolate, which is traditional ingredient of healthy product, because of presence of polyphenol, magnesium and other valuable ingredients.